An injured fin can result in fin rot. Fin rot is a common problem for goldfish and is often easy to treat and reverse in the early stages of decay. Fin rot is not a disease — it's an unattractive symptom of disease that can result in the death of your goldfish if ignored. The main cause of fin rot is poor water quality. All aquariums contain bacteria that is not usually harmful to your goldfish. 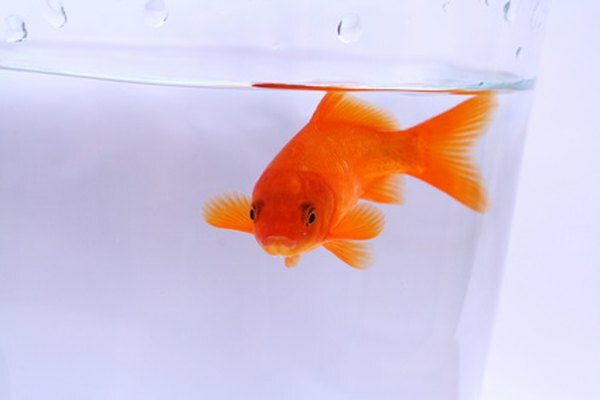 However, your goldfish is prone to infection if he has a compromised immune system or lives in high stress conditions. Elevated bacteria caused by infrequent cleaning and insufficient water treatment leaves your goldfish open to infection. If an open wound occurs because of poor handling, sharp aquarium ornaments or from a nippy cohabitant fish, the wound becomes a portal of entry for bacteria. Bacteria grows in the fish's intestines producing a toxic mucus. The toxins are absorbed by the intestines and enter the bloodstream, according to Happy Goldfish. Once in the bloodstream, damage can occur to vital organs. Bacterial fin rot has ragged edges with red streaks, but fin rot caused by a fungus decays evenly and the edges of the fin appear white. If the bacteria infection is caused by an open wound, the wound may appear white. As the infection progresses, the fin loses its color and the tissue breakdown worsens if not treated promptly. In severe cases of fin rot, the goldfish's fin is reduced to a stump, according to the FishChannel.com. Body ulcers and abdominal swelling are also a sign of severe fin rot, which may indicate the infection has spread to internal organs. Treating the fin rot starts with replacing the old aquarium water with clean treated water. Salt is an antiseptic, so administer one teaspoon of aquarium salt per gallon of the tank being treated, according to Happy Goldfish. If the fin rot does not improve after salt treatment, purchase a broad-spectrum antibiotic from a pet store or veterinarian. Tetracycline, chloramphenicol and oxytetracycline are often the antibiotics of choice, but a veterinarian may recommend a cocktail of antibiotics, according to FishChannel.com. Once the fin rot reaches the fin base, the fin damage is permanent, so start treatment as early as possible, according to Pet Goldfish. If the pH, ammonia or nitrates are too high in the aquarium, tissue breakdown of the fins can occur, so test your water frequently. A healthy fish living in an ideal goldfish environment is less prone to illness and fin rot, so in addition to cleaning your water, ensure your goldfish has a balanced diet with plenty of vitamins. To avoid injuries, don't overcrowd your tank or put your goldfish with aggressive species. Thoroughly check aquarium equipment, plants and ornaments for sharp edges before placing anything in the tank with your goldfish. How Often Should You Change Aquarium Water? What Can I Mix With Shubunkin Goldfish?